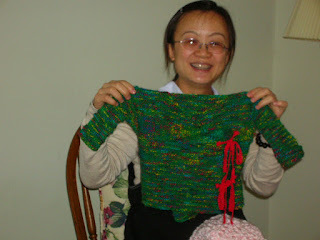 One of my Knit Wit friends says she never saw the pics of the baby kimono sweater I make for Lei-Ping's baby. Here it is! I think it'll be a few months before her baby will be able to wear it w/o swimming in it, though. I'll have to see if I can get some pics of baby in it soon, nevertheless. 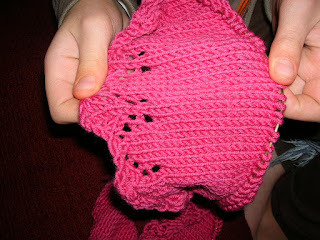 Do you remember this pink baby jumper I made? Here is the detail of the hem. And here is Baby Lucia visiting us at the library wearing her lovely finery! Beautiful Lucia Catherine! They say her middle name is because of some grandmother or something . . . but golly, it still makes me happy! And isn't she darling? Seems like whenever I hold her she quickly goes sound to sleep. Also, in a fit of maternal envy I volunteered to babysit. LOL But wouldn't you do the same? She's so soft and cuddly! What a beautiful baby. I want to hold her next. Love the word start-itis. We all seem to have it. The chalk drawing is great. What talent.